These are photographs relevant to Anecdotes in the Pask, Paske One-Name Study. Click on the photograph to link to a person's narrative, or to display a larger image of images associated with events, sources, or citations. 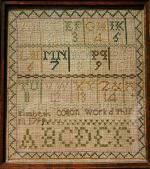 Sampler made by Elizabeth COTTON [Cottam], in 1791. 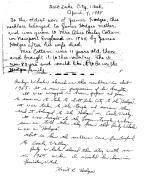 He was awarded a pension of $30 per month commencing June 16 1913 (when he was 75). This was increased to $40 per month commencing June 10 1918 (when he was 75).